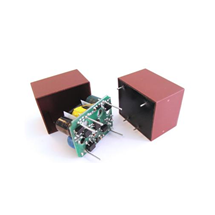 World famous and just as popular, the reliability and the quality of Myrra’s transformers are due to an ongoing further development and production optimization. Myrra's operations are always at the latest state-of-the-art. In-house developments such as the encapsulated transformers, switching transformers and power transformers with real added value set standards across the entire sector. Since the company’s establishment in 1950 Myrra has become a major operator in the field of transformers for electronic applications. Myrra has ambition to become, in the three following years, number one in Europe concerning the molded transformers.